Orioles fans watching the game had plenty of reasons to get excited from the first inning on; number two prospect Eduardo Rodriguez picked an excellent time to have a little positive regression on his side after allowing an ugly 9 earned runs in just 14.2 IP through the rest of the season. He took the mound for the start and came off with the win after three shutout frames where he gave up just two hits and a walk, striking out four. After Rodriguez, the bullpen placed six innings of finishing touches on the shutout, including two by Brewers farmhand Tyler Cravy and a Houdini move by another Orioles prospect, Tim Berry, where he escaped a bases-loaded jam in the sixth. On top of the strong pitching performances, two more Orioles prospects pitched in on the other side of the ball to ensure the Cacti took home the crown, with Henry Urrutia continuing to do what he did throughout the season (hit, hit and hit) and number four prospect Jonathon Schoop even awakening from his fall slumber to get driven in after a single for one of the games two runs. The Sox had many less things break their way, with offensive cornerstones Bryant and C.J. Cron combining to go 0-8 with four whiffs, leaving a combined 9 on base. The rest of the offense did scarcely better, failing to mount any kind of real threat, Tim Berry’s sixth inning heroics notwithstanding. It’s no small wonder, then, that in spite of the Sox’ pitchers stellar efforts they are heading home defeated for the offseason. Given that the goal of the leagues is development, and both clubs and their affiliates saw great strides by many of their young players this year, there is no way that Mesa views this season as anything but a resounding success. 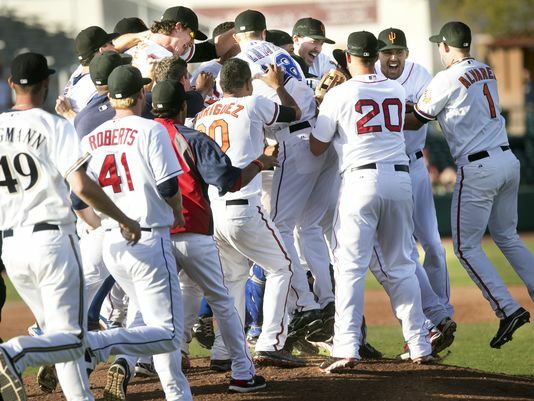 And for the Saguaros and their impressive crop of offensive stars in the making, there are plenty of extra reasons to celebrate their first AFL championship since 1995. Orioles fans are now getting a glimpse of their long-promised bright future, and as a fan of their AL East competition, I can’t say I’m not sweating it a little. Posted on November 17, 2013, in Arizona Fall League, Orioles, Outing Report, Top Prospects and tagged CJ Cron, Dallas Beeler, Eduardo Rodriguez, Henry Urrutia, Jonathon Schoop, Kris Bryant, Tim Berry, Tyler Cravy. Bookmark the permalink. Leave a comment.